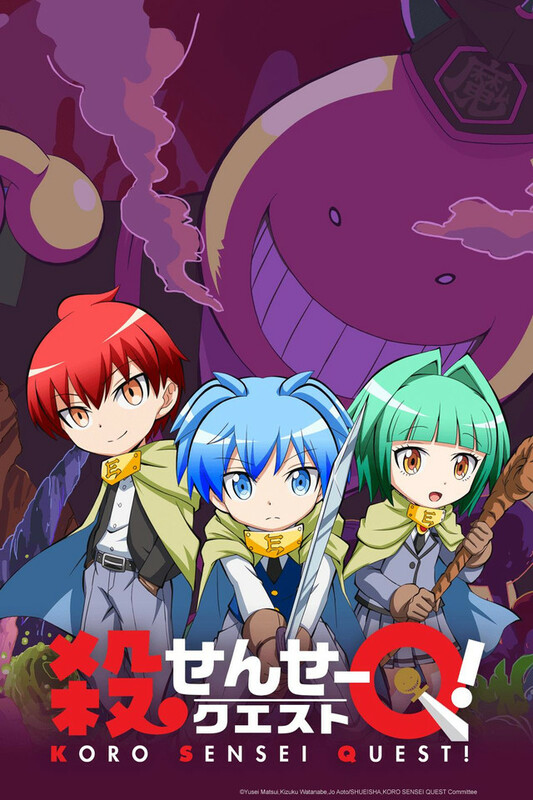 Assassination Classroom is definetly one of my favorite animes of all time, and im glad its back with a new spin-off anime, i also love the manga of Koro Q!, the character development in the characters are very good with a funny and sometimes intense moments that we have in the series in this anime and the original one, i recommend this manga series to everyone. Now this ...is a fun Parody to watch! First: I am a big fan of Assassination Classroom and not what I would call a huge fan of Parody and Chibi shorts in general, however, I really did get a laugh out of these! These 10-minute episodes are chock full of funny bits and scenes. Things like dazzling armor! .. from the front, but open in the back and tied with strings. I also loved how they did a bunch of parts, like the ED, that is reminiscent of old Nintendo and Playstation adventure classic RPGs. The situational comedy sometimes hinges off things from the "Assassination Classroom" anime (Anatsu Kyoushitsu), so if you've not yet watched Seasons 1 and 2 of that, I recommend you do that first to get the full "funny" of this great Parody. I have known AssClass for a year now, and when I knew this was coming, I just felt relieved. Live Action was not enough for me as the original manga and the anime ended. To watch this after reading 2 chapters of the manga it is based on, I really enjoy my time. Even though there is only 10 minutes. It's worth the waiting. The original animators of the anime also animated this ONA. I am so happy. The chibi-versions of the characters are just too adorable. Even Karma and his sexiness still shone through his... cute character. Even though the story is more... RPG like, there is still similarities to the original story, so it is quite enjoyable. I wonder how far it will go. Will we see Takaoka maybe? I look forward to that! I definitely recommend watching the full Assassination Classroom series before watching Koro Sensei Quest! - you will get much more enjoyment out of the show that way, as there are some plot heavy inside jokes! Personally, I love these chibi parody spin-offs. This one does not disappoint, as it was made by the same creators of the original show, and the animation, music, and overall fun feeling are still retained. While other parodies may place the characters in high school (like Attack on Titan: Junior High),this one has characters already in school - so instead, they are placed into an role playing game type of setting. It is very light hearted and nicely integrated. The reason I gave it only three stars instead of four or five was that I did find the humor a predictable and repetitive at times. For example, they use the "Nagisa feels awkward in a dress" gag at least five times. If the parody does anything better than the original show, it should be the humor! But while I was not rolling on the floor laughing, I did smile, so it was not a complete failure. With that being said, there are other times when the humor is spot on. They have some very funny allusions to big events in the real show, and it is a treat to see them reimagined in such a fun and cheerful way. Additionally, all of the characters are recognizable in action and deed, so it feels like a genuine addition to the show and not a cheap copy. I don't recommend watching it unless you watched Assassination Classroom and enjoyed it. If you did, I still only recommend it if the RPG/humor basis sounds appealing to you, as it is the most novel part of this show. But if all of those things interest you, then I believe that you may really enjoy this nice spin-off. This is incredibly adorable, don't get me wrong on that. They did fill in quite a few information gaps that were left by Assassination Classroom. I appreciate learning a little more. However, I feel like they focused a little tooooo much on the comedy part. And I get that is what this is supposed to be, I get it is a spoof spin-off, but I am disappointed because I really did want to see more actual material. This was such an awesome 'alternative' version of the way the show went. I need more of this anime in my life. I loved how the ending was 8-bit music, and the fact it played out like an RPG. I loved how they all had 'glitches' and how they worked were very different. Must watch! The plot is pretty similar to assassination classroom, as expected. Although, this is the magical chibi version. This anime is super funny, cute, & lighthearted. I don't know what people are expecting but this is just a parody, it's supposed to be cute and easy. Really nice spinoff series that pays homage to the original. There's some hilarious moments in this, a lot which become even funnier with knowledge of the original series. For so much story being packed into a comedic 12 episodes every character gets a chance to shine and it keeps you smiling the whole way through. 10/10 you'll love this if you loved Assassination Classroom! First off be sure to watch at least season one of Assassination Classroom before diving in. With that said this series is short. Twelve ten minute episodes mean that this can be binged in two hours. The chibi version are adorable and the each episode is quite funny. Be warned though if you watch this with ZERO context of season one of Assassination Classroom then some jokes won't hit their mark. If you want more AC and you are cool with chibis then you cannot go wrong with this cute and funny, however short, spin off. Earth is threatened by an enormously powerful monster who destroyed 70% of the Moon...waiti wait that was Assassination Classroom. The story is the same but what if they had magic and cute little bodies. Someone decided that would make fans happy. Or at least get you to watch but this anime has none of the things that made Class 3E your favorite bunch of losers turned assassins.